Eloquent CSV Importer can be easily installed using Composer. Just run the following command from the root of your project. After this, publish the vendor files to copy the CSV definitions migrations to your migrations folder. Publish the migrations, add any additional columns to the csv_defintions table you may want & migrate. Add the CSVMappable & HasCSVDefinitions traits to the model you want to store CSV definitions agaisnt. Specify the columns that you want to be allowed to be mapped by overriding the getCSVMappableColumns() function, by default it uses all the columns of the model. You can now use the created definition to convert CSV files / strings into the related models. 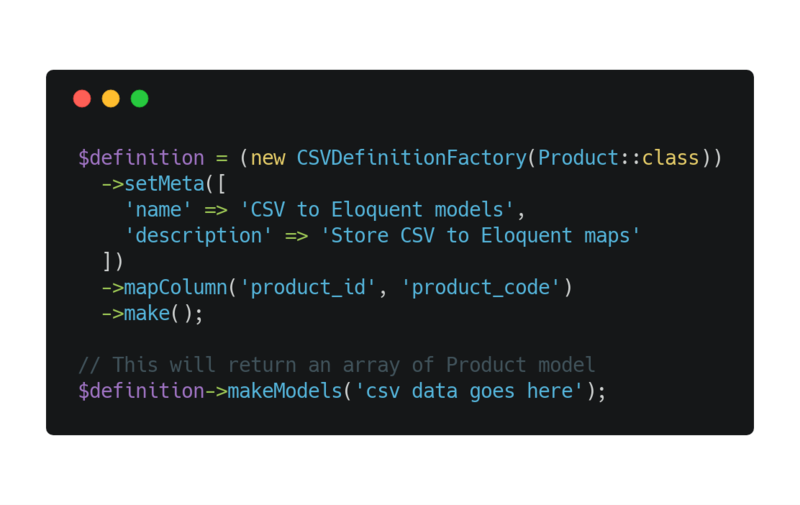 Eloquent CSV Importer allows not only the creation of models from a CSV but the updating of models based on specified keys in the CSV. The above code will now update or create a product model by finding a product where product_name is equal to the value in the current CSV row or by creating a new one with the data in the current CSV row if one doesn't already exist. This will update an existing product where both values in the product are equal to the specified values in the CSV row.